14,000 nursing professionals have made UPMC their employer of choice—now it’s your turn to discover why! We’ll be sharing the stories of five UPMC nurses and why they chose to be part of UPMC’s mission to provide Life Changing Medicine to Pittsburgh and beyond. 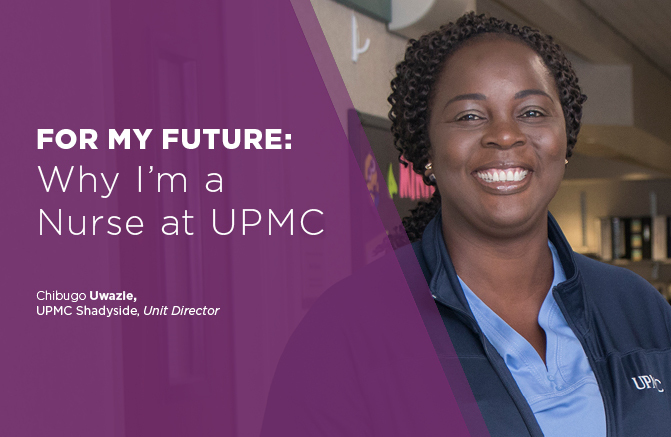 Chibugo Uwazie’s story of how she became a nurse at UPMC is one of unexpected changes, inspiring moments, and hard work. It’s also a story of talent, determination, and compassion — qualities that have helped Chibugo, a unit director for UPMC Shadyside, achieve success and become a role model here at UPMC. Chibugo’s story began in her native country of Nigeria, nearly 6,000 miles away from Pittsburgh. When Chibugo finished high school, she was trying to decide where life would take her next. Though she was offered several nursing school scholarships and many people around her encouraged her to become a nurse, she decided she would pursue education to become a lawyer. That decision would take her away from Nigeria to America, a move that would alter the course of her story forever…and eventually bring her to UPMC! After Chibugo moved to America, she realized a theme emerging: she is a caregiver. While in the hospital shortly after delivering her second child, Chibugo was inspired by a nurse who provided her care during her stay. “Her humility, humanity, and compassion inspired me to become a nurse and hopefully to influence others the way she influenced me,” she recalled. The call to care was a strong one, one that Chibugo felt compelled to answer. After her experience, Chibugo began working towards the future she was inspired to pursue — a future as a nurse! Chibugo’s journey to become a nurse required turning her dream into a reality through hard work, long hours, and a balancing act. Chibugo acquired all of her training to be a nurse while she raised her children at home. Once Chibugo became a nurse, she didn’t stop there — the future held more exciting changes for her! On behalf of UPMC Careers, we’d like to say this to Chibugo: we’re grateful for your impact and can’t wait to see where the future takes you here at UPMC! Whether UPMC nurses are building specialty skills, gaining experience in various settings, or continuing education, a career on our team allows you ample opportunities to grow, develop, and make a difference in the fast-paced field of nursing. Explore open positions at UPMC Presbyterian and UPMC Shadyside on our careers site, or click the button below to find positions in nursing that interest you.